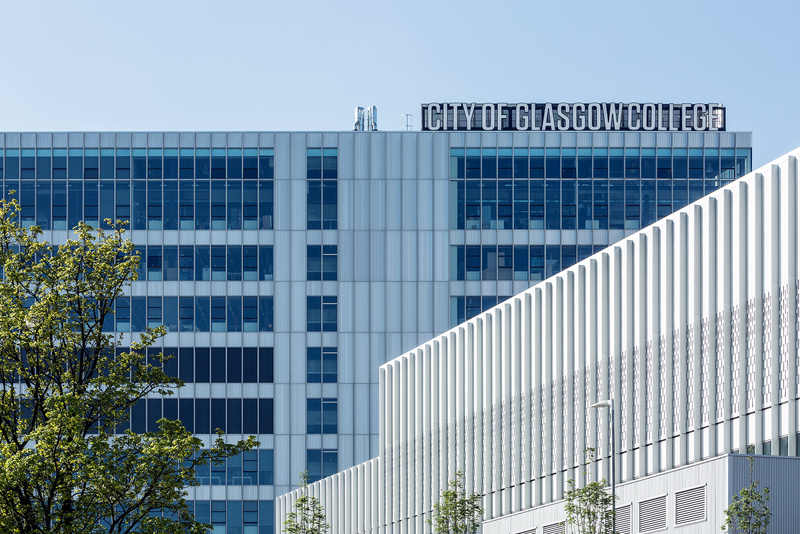 Last week the multi award-winning project team that delivered City of Glasgow City Campus came together to celebrate their collective achievement. Graven Director, Ross Hunter said: “Graven was embedded with the project team from the bid stage. We helped to organise the base palette and had some fun with interventions throughout the building, altogether about 35 micro projects ranging from training spaces to departmental “thresholds”. Graven’s touches can be seen throughout, particularly in the public, social and learning areas. The added value for the client, and for the people who ultimately occupy these learning environments, is that everything was designed to facilitate leading-edge real-world learning and interdisciplinary collaboration. Social learning spaces are flexible and overlapping and were instantly colonised by students. Students’ Association Cafe featuring a striking orange container with hydraulic shutter. The Faculty of Building, Engineering and Energy featured on the tour. Everything in here is real and on a huge scale. From a hallway above, a kind of viewing platform, you can see into a vast double height warehouse space, divided into training areas where students learn trades such as stone masonry, plastering, floor laying and tiling. 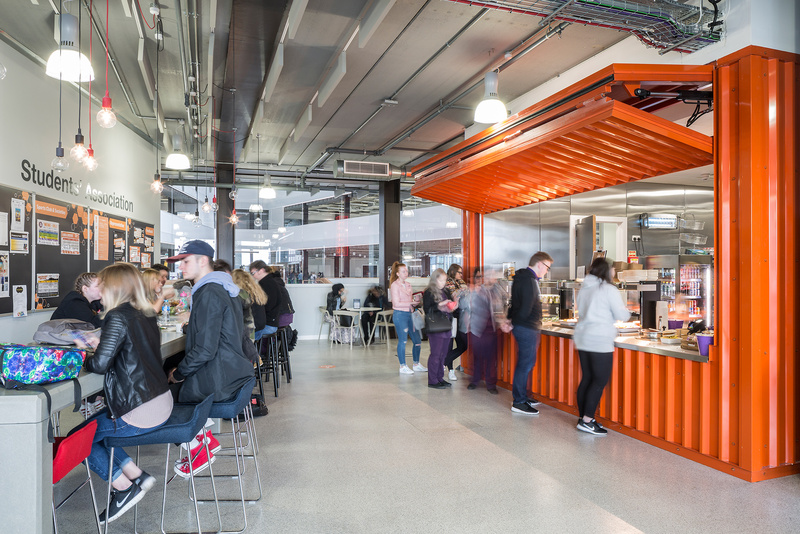 The Work Wear Café, also affectionately referred to as the ‘dirty café’, is a place where students can grab a bite to eat without having to change out of their dirty overalls. It’s popular with the Beauty Therapy students too, apparently. The size of the building alone (over 60,000 sqm and ten floors), means it would have been difficult to navigate visually. The building’s spaces flow together, with distinct thresholds that mark departments. While the building is a serious feat of engineering and collaboration, Graven took the opportunity to inject some fun and humour. Like when you enter a new space, it’s not just a sign that labels a Faculty. 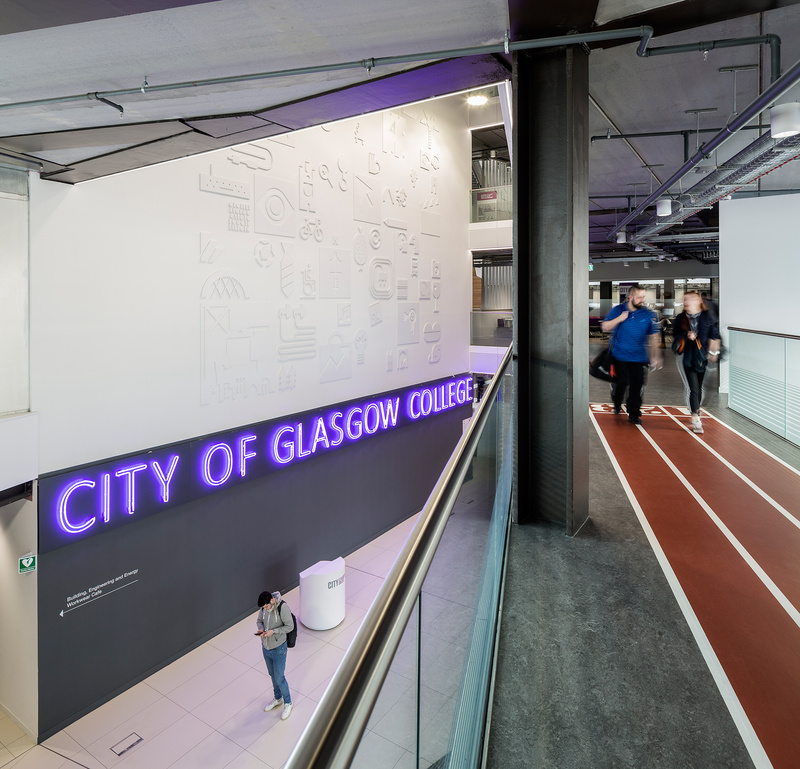 The Faculty of Leisure and Lifestyle, for example, has its own running track in the vinyl flooring. Walkways and mezzanines offer many opportunities to see things differently with interesting vantage points. This acts as a reminder of the clear ambition of City Campus. This really is years ahead of any other comparable building in Scotland, or even the UK. 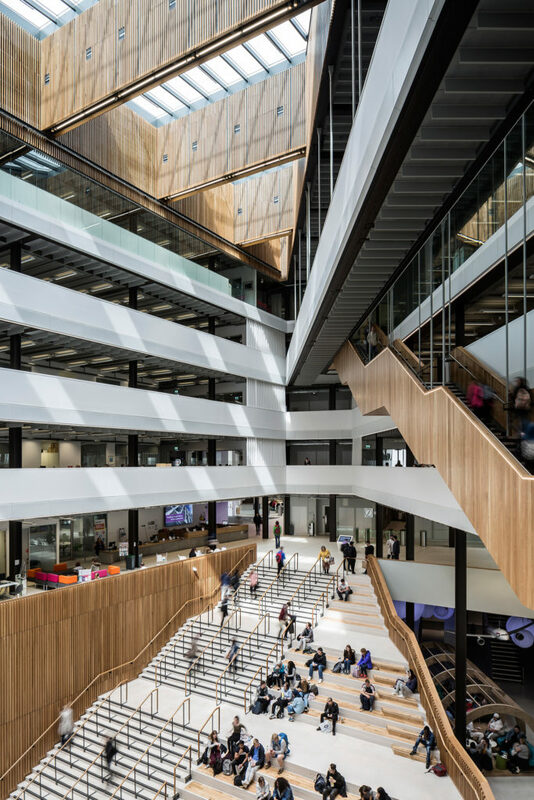 It has secured at least 20 awards, so far, including RIBA National Award 2017, RIAS Award 2017, AJ100 Awards Building of the Year 2017 and Scottish Design Awards Education Building of the Year 2017 to name but a few. Next time you visit Glasgow make sure to pop in to see it for yourself. Visit our project page to read more.